Afflalo has been able to complement the great play of Jameer Nelson, and the results have been exciting for the Magic. Though they’re on a 9-game dry spell, it’s clear that Afflalo and Nelson combo might prove to be a dangerous one as we near the All-Star break. Don’t count the Magic out for a late-season Playoff push. Losses to the Bulls and the Pacers have dampened the New Year somewhat for Miami fans, but this is still the best team out East. Wade has rediscovered his deadly form, and that should augur well as I expect the Heat to pile on the Ws with just Portland and Sacramento up next. Though the Knicks are 2-2 to start 2013, they’re still a plenty dangerous squad. That’s mainly because of Melo, but one cannot discard the contributions of JR Smith. Smith has been a spark for coach Mike Woodson, and he, along with the stellar play of Tyson Chandler, has been a huge reason for New York’s dramatic improvement this season. At least for now, Kobe is NOT the most productive off-guard in the world. He stills scores and defends like crazy, but it’s puzzling to see how his Lakers have not really translated these into wins. The Lakeshow team lost its last 4 games and with San Antonio and OKC up next, and Gasol and Howard out, prospects don’t look bright at all. All-Star material for sure. Harden has followed up his breakout 2011-2012 campaign, and great Olympic stint, with a career year as the best Rocket acquisition since… Clyde Drexler? The Rockets have won their last 5 assignments thanks to Harden playing like a man possessed. He’ll be tested against Paul Pierce’s Celtics and Philly’s Evan Turner in Houston’s next two games. 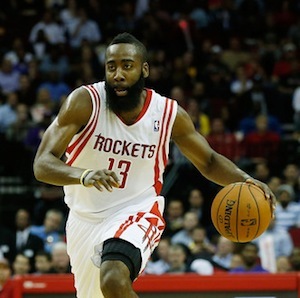 James Harden has been the best SG of 2013... so far. Paul George recorded a double-double with 29 points and 11 rebounds, as the Indiana Pacers took down the Miami Heat, 87-77, in a rematch of last season's Eastern Conference semifinals. Tuesday's meeting between the two teams was the first since Miami beat Indiana in six games in last season's playoffs. David West added 14 points and 11 boards for the Pacers, who have won two in a row. Lance Stephenson tallied 13 points. 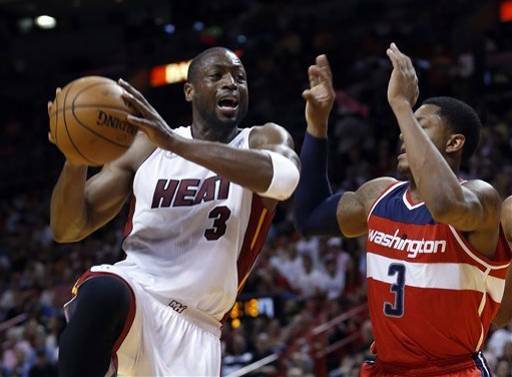 Dwyane Wade ended with 30 points for the Heat, who started a six-game road trip on Tuesday. LeBron James donated 22 points and 10 rebounds. Deron Williams scored a game-high 22 points on 7-of-11 shooting and handed out five assists as the Brooklyn Nets blasted the Philadelphia 76ers, 109-89, on Tuesday at Wells Fargo Center. Andray Blatche netted 20 points and pulled down seven rebounds and Joe Johnson finished with 15 and five assists for the Nets, who have won four in a row. Brook Lopez added 13 points and Reggie Evans contributed a career-high 23 rebounds in the victory. Jrue Holiday netted a team-high 19 points and dished out eight assists while Spencer Hawes added 14 points for the Sixers, who have dropped four straight and six of seven. Nick Young donated 11 points in a losing effort. James Harden poured in a game-high 31 points and handed out nine assists on Tuesday, as the Houston Rockets defeated the short-handed Los Angeles Lakers, 125-112, at Toyota Center. Chandler Parsons added 20 points, while Jeremy Lin and Carlos Delfino donated 19 points apiece for the Rockets, who have won five straight and 10 of their last 12 games. Los Angeles was playing without two-thirds of its starting frontcourt, as center Dwight Howard and forward Pau Gasol are both out indefinitely. Howard sustained a torn labrum in his right shoulder and will be re-examined in a week, while Gasol did not make the trip to Houston due to a concussion. Metta World Peace paced the Lakers with 24 points and Kobe Bryant followed with 20 points, seven assists and five boards in the setback, Los Angeles' fourth in a row. Steve Nash notched his 10,000th assist in the loss, making him the fourth fastest to reach the mark in NBA history (1,162 games). He finished with 16 points and 10 assists. The Milwaukee Bucks began the Jim Boylan coaching era on a positive note. A day after the team and former coach Scott Skiles mutually agreed to part ways, the Bucks ended a four-game skid by downing the Phoenix Suns, 108-99, behind 29 points and nine assists from Brandon Jennings. Jennings shot 9-for-15 -- including 5-of-7 from beyond the arc -- in leading seven Bucks players in double-figures. Larry Sanders tallied 10 points, eight rebounds and six blocks, while Ersan Ilyasova and John Henson each scored 12. Henson also pulled down 11 boards in the victory. Boylan was named the interim head coach for the remainder of the season. The Suns continued their road struggles with their 10th straight loss away from home. Goran Dragic led the team with 21 points and Marcin Gortat and Luis Scola each posted double-doubles. Gortat tallied 16 points and 14 boards and Scola finished with 12 points and 10 rebounds in the defeat. Nikola Pekovic dropped a game-high 25 points and pulled down a career-high 18 rebounds as the Minnesota Timberwolves posted a wire-to-wire 108-103 victory over the Atlanta Hawks on Tuesday at Target Center. Andrei Kirilenko netted 21 points on 7-of-11 shooting to go with six rebounds and five assists, while Derrick Williams added 17 points for the T-Wolves, who beat the Hawks for the first time since April 9, 2006, snapping an 11-game slide. Alexey Shved scored 15 points and dished out seven assists and Luke Ridnour added 10 points in the victory. Josh Smith netted 21 points and grabbed 13 boards and Louis Williams scored 21 to go with eight assists for the Hawks, who have lost four of their last five. Al Horford donated 19 points and 11 rebounds and Kyle Korver contributed 15 points in the setback.